Broccoli salad seems like such a good idea but I’m not a big fan of eating a lot of broccoli raw. So I decided to make it with the broccoli steamed just enough to soften it a little. Bingo! I accidentally dressed the broccoli before steaming it and I like the way it turned out. Some of the Vegenaise soaked off the broccoli but the remainder steamed into it very well. Copy my serendipitous mistake or steam the broccoli first as in the recipe I adapted, PCC Broccoli Waldorf. I used Sunview Jumbo Organic Black Raisins which are my favorite. Between the raisins and the sweet cherry tomatoes I didn’t add any sugar and didn’t miss it. This served four with leftovers as a main course. 3 lbs. broccoli, crowns cut or broken into small pieces, stems peeled and cut into small pieces. Prepare broccoli. Mix with Veganaise. Steam in a very small amount of water until somewhat softened but not fully cooked, about 3-4 minutes. Broccoli with Creamy Lemon Herb Sauce (silken tofu-based) Broccoli with a creamy, lemony sauce that's also healthy-- it's silken tofu based. Veggie Salad Bowl with Almond-Cilantro Dressing A fall lunch or dinner salad with red kuri squash, broccoli, and peas and an Asian-style almond cilantro sesame dressing. 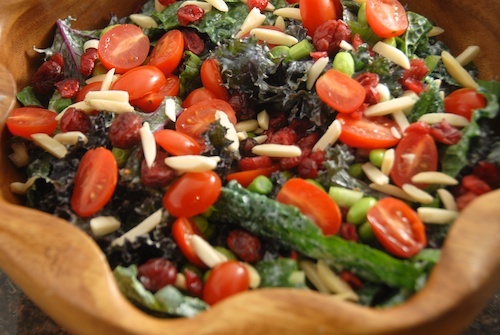 Kale Edamame Salad Dark green and purple kale, red grape tomatoes and pea green edamame are topped with chopped scallions, slivered almonds, dried cranberries, and a creamy tofu-based lemon-herb dressing. 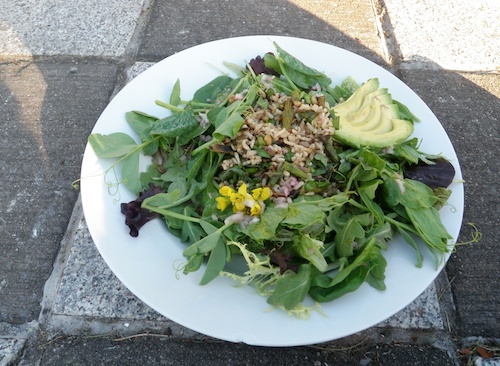 Inspired by Trader Joe's Kale and Edamame Bistro salad, it's enough for a full lunch. 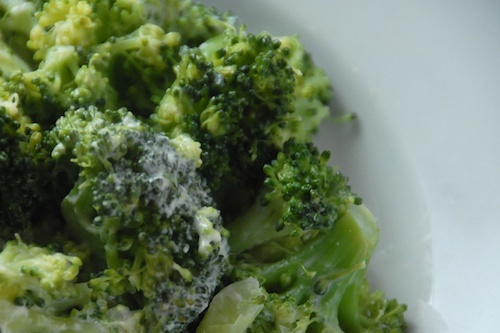 Not normally a broccoli fan, but your picture makes it look so beautiful–I may have to try! And the idea of dressing first, then steaming is very intriguing. Will report back if I become a broccoli convert! Thanks Jo. I hope you do give it a try. 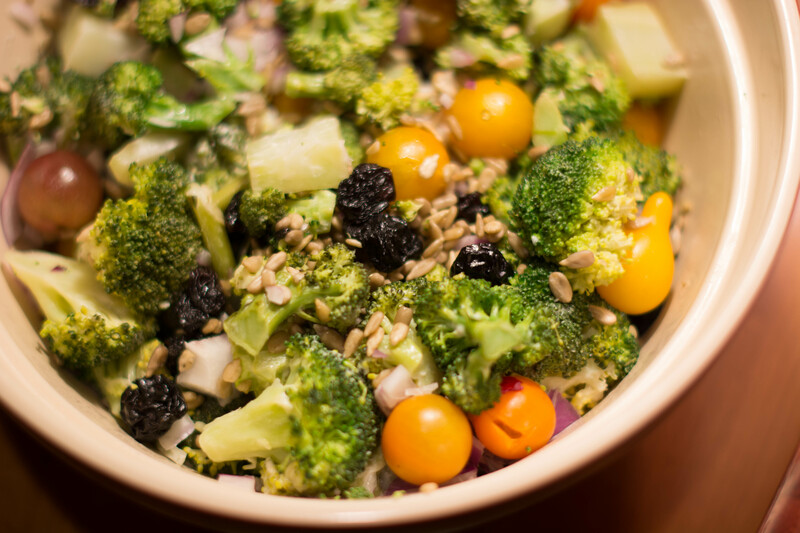 The raisins, cherry tomatoes and sunflower seeds do add a lot to it so it so it’s more than just broccoli. I have a goal to eat at least one serving of cruciferous vegetable every day. They are so good for cancer prevention and other things. Adding in raisins is something fun and new! We like it that way. I’m kind of a sucker for adding raisins to recipes. I LOVE broccoli salad. My husband does, too. My kids? Notsomuch. Well keep offering the veggies, my kids gradually came to enjoy more and more foods, even through the teenage years and beyond. That’s a good obsession to have, especially at this time of year when there starts to be so much unhealthy food around! Lots of flavour and colour! My family would love this! Give it a try, I hope they will! This sounds good…broccoli is always tasty, and the raisins sound like a great add-in. I bet craisins would also work? Kimberly Hatting recently posted..Getting it Done! This looks delicious! 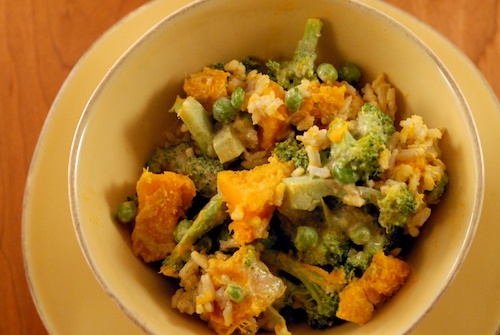 Broccoli is one of my favorite vegetables and this recipe is a great way to amp up the flavor. Thanks Kimberly! I hope you will give it a try! Loooove broccoli and definitely trying this one. Broccoli is one of my favorites and the added bonus is my kids like it too! This recipe looks like a good one! Oh I’m glad your kids like broccoli, that must make your mom heart happy! Broccoli is my fave and I love it in a salad! I’ll bet the raisins add a nice sweetness! What a great idea to steam it. That’s the way I like it, LOL! When I’m cooking I get to make it my way! Looks great! I do love raw broccoli so would be just fine with it as is! Well try it that way then! How does the rest of your family like it? It’s always great to find a new way to eat broccoli! Sounds yummy. Yes it’s always good to add to the cruciferous veggie repertoire. Oh, I love raisins in a salad like this! Steaming the broccoli was a great idea – I might try it roasted too. I wouldn’t have thought of that, let me know how it is! I roast cauliflower all the time but somehow I almost never roast broccoli.